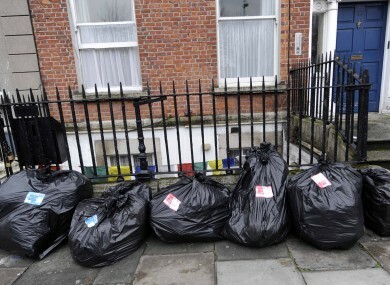 A BIN COLLECTION company in Dublin has told 18,000 of its customers that their rubbish will not be collected this week unless they pay an upfront fee. Greyhound has threatened to withdraw collections from Thursday if households do not sign up to their private service. The company took over Dublin city’s waste collection services after it won the contract from the council in January. Customers had until this week to pay the first instalment of the annual €100 service fee. Greyhound has said there will be no exceptions made and that anyone who has not paid at least €50 of the upfront fee will not have their waste collected later this week. Fine Gael TD Catherine Byrne has hit out at Greyhound for its “punitive approach” and “bully tactics”. She said that the people in the South Dublin County Council area were given a three-month lead-in when their operators changed. She also criticised the company for leaving bin collection services across Dublin “in a shambles”. She said that a month after the company took over the refuse service from the council, customers are still facing problems. Customers have been treated “appallingly during this entire episode,” continued Byrne. She said that customers are still complaining about uncollected bin bags, confusion about collection days and poor customer service. Sinn Féin has called for a Dáil debate about the issue with Dublin Central TD Mary Lou McDonald echoing Byrne’s statement that the system has been “shambolic from start to finish”. She said she is concerned that even more illegal dumping will be seen across inner city Dublin if Greyhound refuses to pick up waste. Email “Greyhound warns 18,000 customers that bins will not be collected”. Feedback on “Greyhound warns 18,000 customers that bins will not be collected”.